Jim Henson is without a doubt the most famous puppeteer in history. 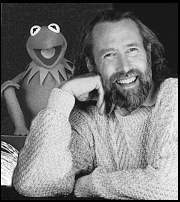 Both the creator and a performer of the “Muppets,” Henson is known throughout the world for his puppet creations, which include such characters as Grover, Elmo, Big Bird, Bert and Ernie, Miss Piggy, and especially, Kermit the Frog, whose voice was provided by Henson and who remains the muppet with which Henson is most closely associated. Through television and later through feature films, Henson developed the art of puppetry to new heights of technical expertise and storytelling capabilities, particularly in the ability to create sympathetic, emotional characters with whom audiences, both young and old alike, can relate. James Maury Henson was born September 24, 1936, in Greenville, Mississippi, the second son of Paul Ransom and Elizabeth Marcella Henson. He grew up in nearby Leland, where his father, an agronomist, worked for the U.S. Department of Agriculture. His childhood was a happy one, as he explored both his artistic interests and the local countryside, whether alone or with friends. One of his childhood friends, Kermit, would later inspire the name of Hensons most celebrated creation. When he was in fifth grade, his family returned to Maryland. Henson’s first television appearance occurred while he was still in high school, performing puppets on a local Washington, D.C., Saturday morning program on WTOP-TV. While a freshman at the University of Maryland, he turned professional when a local NBC affiliate hired him to do a five-minute late-night show called “Sam and Friends.” His first performing partner, Jane Nebel, would later become his wife. In creating the “muppets”a combination of the words “marionette puppet”Henson rejected the painted wood appearance of most puppets of the period because they were not sufficiently expressive of emotion. Instead, he crafted his puppets, including an early version of “Kermit,” who was not yet a frog, out of flexible, fabric-covered foam rubber, giving them supple bodies and large mouths that allowed them to convey a wide range of emotions. Success from the show proved the stepping stone for a series of commercials that brought him nationwide fame. Soon, he was making guest appearances on such national network programs as The Steve Allen Show, The Jack Paar Show, and The Today Show. In 1961, as Muppets, Inc. grew, Jim and Jane brought on puppeteer and writer Jerry Juhl, who would become one of Jim’s major collaborators. The Hensons moved to New York in 1963 as his television appearances grew to include The Tonight Show, Ed Sullivan, and The Jimmy Dean Show, and weekly appearances on The Today Show as well as commercials. To keep up with demand, he hired master puppet builder Don Sahlin and young puppeteer Frank Oz. During this time also, he experimented with short films, including “Time Piece,” which was nominated for an Oscar for best live-action short subject. In 1968 he broadcast his first television special, “Muppets on Puppets,” for National Educational Television. With the premiere in 1969 of Sesame Street, the Muppets reached superstardom. Produced by the nonprofit Children’s Television Workshop, Sesame Street used flashy imagery and quick pacing common in television commercials to teach preschoolers about letters, numbers, and social values. PBS producer Joan Ganz Cooney had invited Henson to create a family of Muppet characters to populate Sesame Street. Henson and his creative team created a number of memorable characters for Sesame Street, including Oscar the Grouch, Bert and Ernie, Grover, Cookie Monster, and Big Bird, each with distinctive personalities. Henson’s success on Sesame Street paved the way for his next television production, The Muppet Show, a weekly syndicated variety show hosted by Kermit the Frog with an expanded cast of both new and familiar muppets and guest starring live actors and celebrities. The show was an immediate success upon its premiere in 1976 and was still popular when Henson decided to cease production in 1981 in order to concentrate on greater challenges. His company by now had expanded to include a wide variety of children’s programming and educational materials, including books, music, and television shows, such as Fraggle Rock on HBO and Muppet Babies on CBS-TV. His primary creative interest, however, was in motion pictures. In 1979, he had scored a hit with young and old alike with the first big-screen Muppet movie, titled simply The Muppet Movie. The musical-comedy launched a series of Muppet movies, including The Great Muppet Caper (1981) and The Muppets Take Manhattan (1984), which has continued into the present. During the 1980s, Henson also produced two big-screen productions starring a cast of puppets other than the familiar cast of Muppets. The Dark Crystal (1982) and Labyrinth (1986) expanded the art and craft of puppeteering to new levels of technical achievement. Henson also continued to produce some memorable television programs and specials. Jim Henson’s The Storyteller and Jim Henson’s Greek Myths were original series conceived by Henson to convey the metaphoric richness of ancient stories. Based on authentic myths and folk tales and produced with a strong literary research team, the two series represented a rare combination of ancient tradition and modern technological artistry. Henson died of pneumonia in New York on May 16, 1990. Over the course of a career spanning more than 30 years, Henson received eighteen Emmy awards, seven Grammy awards, four Peabody awards, and numerous other honors. You can find out more about the Jim Henson Company online. Time Piece. (Also producer and director.) Contemporary Films, 1965. The Cube. Teleplay. (Co-author, producer and director.) Broadcast by NBC-TV, 1969. The Muppet Show Book New York: Abrams, 1978. In addition to these works, Henson’s Muppets have been the basis for hundreds of books for children, including Sweet Dreams on Sesame Street (Random House, 1983); You Are the Star of a Muppet Adventure, by Ellen Weiss (Random House, 1983); and Muppet Babies at the Circus (Random House, 1985). Henson’s film and television productions are too numerous to recount here, as are his varied roles in them: he often served as writer, director, producer, and “performer” (as puppeteer and voice) in his productions, and occasionally in other roles as well (such as choreography for The Muppets Take Manhattan). A comprehensive filmography, which includes television productions also, is available online at the Internet Movie Database (http://www.imdb.com/). Bacon, Matt. No Strings Attached: The Inside Story of Jim Henson’s Creature Shop. New York: MacMillan, 1997. Finch, Christopher, and Charles S. Finch. Jim Henson: The Works: The Art, the Magic, the Imagination. New York: Random House, 1993. Henson Associates. The Art of the Muppets: A Retrospective Look at Twenty-five Years of Muppet Magic. New York: Bantam, 1980. St. Pierre, Stephanie. The Story of Jim Henson: Creator of the Muppets. N.p. : Gareth Stevens, 1997. Jim Henson: The Father of Dreams. Muppets Home Page, by Bill Sherman. This page has been accessed 11915 times. About this page counter. Last Revised on Monday, November 9, 2015, at 04:35:11 PM CST.